I know what you’re thinking… Cake isn’t a craft, Sarah! But believe me when I say that this particular cake is a craft. An art, even. Yes, friends, I have found the perfect holiday dessert. But not ANY old chocolate porter cake with whiskey frosting: Chocolate porter cake with candied ginger and a whiskey cream cheese chèvre frosting! I adapted the recipe from the Autumn 2014 edition of the LCBO’s “Food and Drink” magazine. 2. Butter and line (with parchment paper) the bottom of a 9″ springform pan. 3. In a large saucepan of medium-low heat, add the porter and chunks of butter, whisking gently. Once the butter is completely melted, add the cocoa, cinnamon, powdered ginger, and sugar and continue to whisky until everything is blended. Remove the pan from the heat. 4. In a large bowl, beat together the sour cream, eggs, and whiskey. When it is completely combined, pour the egg mixture into the porter mixture, whisking quickly so that the eggs do not scramble. 5. Whisk in the flour, baking soda, and candied ginger. 6. Pour the batter into the pan. Bake for about an hour or until a toothpick comes out cleanly. 7. Cool the cake on a wire rack while still in the springform. 1. In a bowl using a stand or hand mixer, lightly whip the butter, cream cheese, and goal cheese together until smooth. 2. Add the icing sugar and whiskey and continue to beat until it becomes spreadable. 3. Use an off-set spatula to ice the top of the cake. This icing is VERY rich, so I would only ice the very top of the cake, not the sides. This icing can become quite runny when it is warm. Just pop it into the fridge if this happens. Yeah, they’re totally checking each other out. Bow-chick-a-wow-wow! See ya next weekend! Have a good one! Sign up to receive the latest posts and news! Flourish & Knot respects your privacy. Your email will never be shared. You may unsubscribe from the newsletter at any time. Your cake sounds and looks amazing. I might save this one for a Robbie Burns dinner – not too far off. Ooohhh don’t scare me by turning those calendar pages earlier than we have to! Delicious! 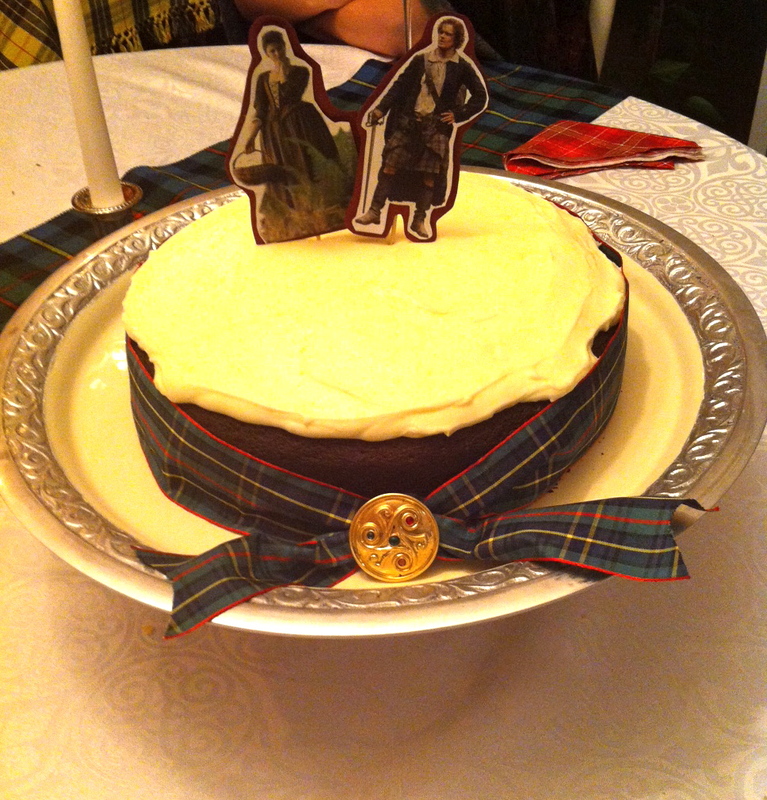 Even without the Claire and Jamie toppers! This cake sounds so yummy to me! Thanks for linking up to the Bloggers Brags Pinterest Party! I’ve pinned your post to the Bloggers Brags Pinterest Board. Wow, this looks good! Thanks for sharing at Merry Monday, hope to see you again next week!